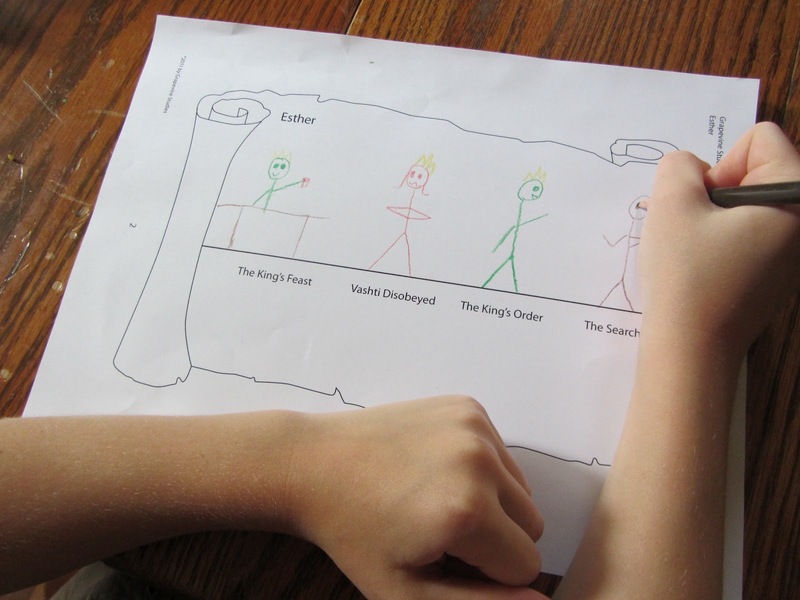 Recently, I was introduced to Grapevine Studies, a comprehensive Bible curriculum that gives a panoramic view of Scriptures using easy-to-draw stick figures and pictorial time-lines. My Littles and I had the opportunity to work our way through the recently updated, Esther course, which is offered in both hard copy and eBook version. 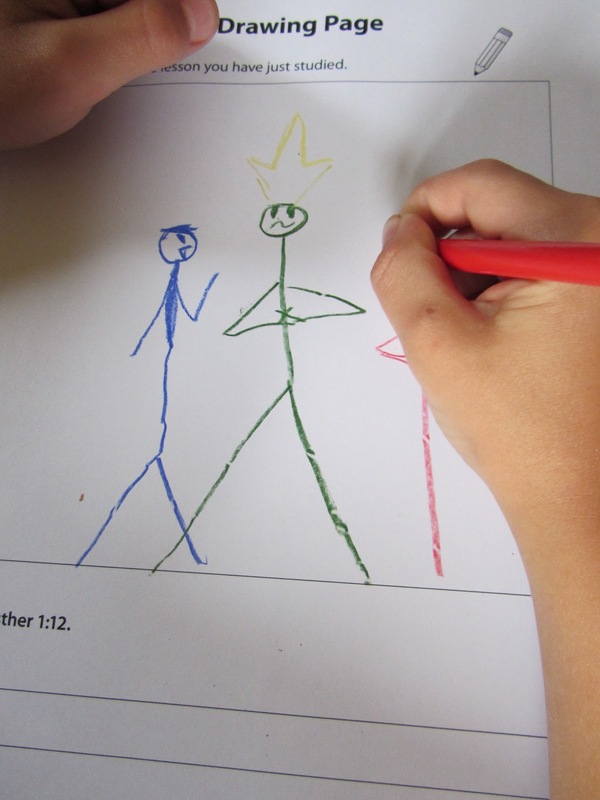 The unique method of introducing CORE Bible knowledge with the use of colored line drawings makes GrapeVine Studies easy-to-use for both teachers and students of all ages. Each series is divided into weeklong units or sections of the story. Day 1 of each unit begins with the introduction of a memory verse and a broad look at the Bible book and/or Biblical event in focus. 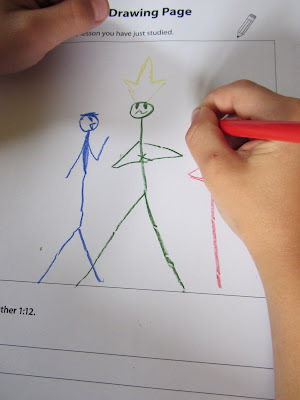 A simple time line using chronological order, color-coded stick figures and symbols, and short 2-3 word phrases is constructed by the teacher. Students are encouraged to replicate this timeline on a reproduceible worksheet. This helps to establish a general framework of the entire story. Day 2 and 3 bring a more in-depth look at the people and events. Teacher and students search out key Scriptures together and recreate the time line in more detail onto story frames. By the end of the week on Day 4, each student is given a review page to illustrate. Using the same key colors and figures as he/she has been using all week, the student recreates his/her favorite element of the story and writes out/dictate the week's memory verse. This particular 9 week GrapeVine Studies course not only takes an exhaustive look at the story of Esther, it also details the Persian empire during the reign of King Ahasuersus and explains how Purim became a yearly holiday for the Jewish nation. I was quite impressed with how well my Littles were able to retain the details of the story because of the thorough repetition. The figures are intentionally recreated using the same colors and accessories. This makes it quite easy for the novice artist...or, as in my case...the artistically challenged to be able to illustrate each scene of the story. And even easier for learners of ALL ages and ALL reading abilities (and IN-abilities) to be able to grasp the key elements of the story and RETELL them to someone else. The well-organized, easy to follow teacher's manual includes thorough teachings of the lesson, key Scripture passages, sample stick figures in the correct color codings, vocabulary word suggestions, and review questions. Each weekly unit of the Esther series is content rich, filled with a thorough look at the CHARACTER of each character. I also appreciated the fact that the story is actually read straight out of the Bible instead of a Bible story book. A handful of verses are read each day and then discussed and dissected. Too often, Bible curriculums just regurgitate the truths of Scripture without actually encouraging the READING of Scripture. Super Boy especially liked working through Esther as it definitely appealed to his artistic bent. And I really liked it as it gave a constructive focus for his busy hands. GrapeVine Studies are designed to TEACH...to develop a working knowledge of the WHO, WHAT, WHERE, WHEN, and HOWs of Scripture. For that reason, I think this would be a great resource for a Bible class, Sunday School, Vacation Bible School, or small group study. Although simple to implement (If I can do it, ANYONE can do it. ), the Esther study is impressively thorough in content. For the most part, the application element of the story...the WHY...has not been included, allowing the teacher to use his/her personal reflections to speak to his/her SPECIFIC audience. Each easy-to-prepare-for series has both a student book and a teacher's manual that can be purchased separately. Prices vary for each series. This particular series focusing on the life and times of Queen Esther comes in both a hard copy and an eBook form. Head on over to GrapeVine Studies to review sample lessons of Esther and any of their other Bible studies or catechism books. Want a GrapeVine Study of your own? From now until August 31st, my friends at Grapevine Studies are giving the readers of The Unlikely Homeschool a discount of 20% off their entire order. Be sure to enter coupon code 12BlogSun to nab this great deal. *This post contains affiliate links. Although I was given a free copy of Grapevine Studies: Esther for the purpose of review, the opinions expressed are honest and completely my own. Thanks for the review. My friend bought the catechism one and I thought it looked awesome! !